Even though we’re quite a long way from a release, it’s hard not to get just a little bit excited about the iPhone 6, particularly given the reports of two new, decidedly larger devices arriving later this year. 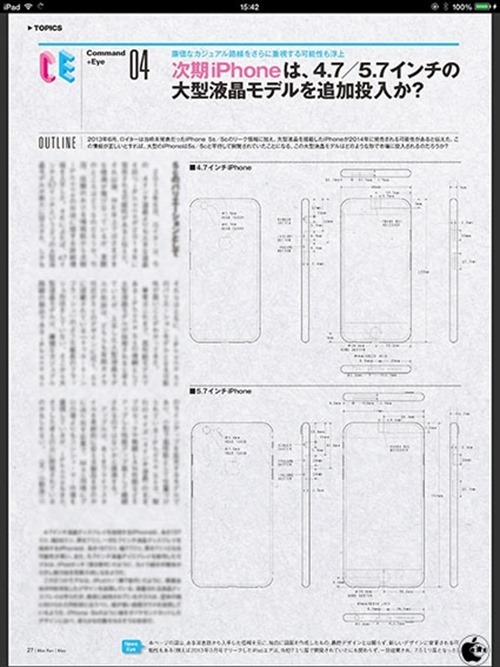 The speculation pertaining to a duo of new devices boasting 4.7-inch and 5.5-inch display sizes has been incessant, but in a twist, some new sketches appear to suggest that a couple of lower-end, ‘iPhone 6c’ devices will also arrive with similar display size configurations. What? As far as analysts, commentators and the tech world in general was concerned, the iPhone 5c had been a marked flop, and as such, would be mercilessly scrapped later on this year with the two new devices on the horizon. The iPhone 5s, so everybody thought, would play the supporting role to two new flagship handsets, and everybody would be happy. But this notion appears to have changed recently. The shift in popular opinion might have something to do with the fact that Apple released the iPhone 5c as an 8GB model for a lower price earlier on this month, and it seems that since that point, the idea of the ‘c’ range being dropped entirely is no longer a done deal. Today’s sketches point to two new iPhone 6c models, one with a 4.7-inch display and another boasting a 5.7-inch panel. As you will notice, the design is akin to the iPhone 5c, with rounded edges and rectangular volume buttons. Four new iPhones, anyone? Of course, we’re more than just a tad skeptical about these renderings, and with very good reason. Besides the fact that Apple simply would not release four new devices in one fell swoop, we couldn’t imagine a lower-end model boasting a 5.7-inch display. When one also considers that the larger ‘iPhone 6’ is expected to pack a 5.5-inch screen, that would mean that the ‘c’ model ended up being the largest of the lot – a move that would make very little sense indeed. Even though we’re treating this leak with a pinch of salt, all hope of Apple maintaining some kind of lower-end series is certainly not out of the question. But are either of these devices likely to manifest come September? Probably not.